Today, Sage CRM helps over 15,000 thousand small and medium sized companies around the world in areas like manufacturing, healthcare and finance. We've updated a dedicated section of our website, where you can meet our customers and learn more about how they are using Sage CRM to grow their businesses. Here, you can read over 100 different stories from our customer and discover how they are using Sage CRM to become more efficient, productive and profitable. The UK-based Kaysersberg Plastics wanted to organise and share customer knowledge, which was stored in several different manual systems. It also wanted a way of enabling tighter management of project pipelines, improve communication across multiple sites, and automate reporting. The company chose Sage CRM because of its easy to use. 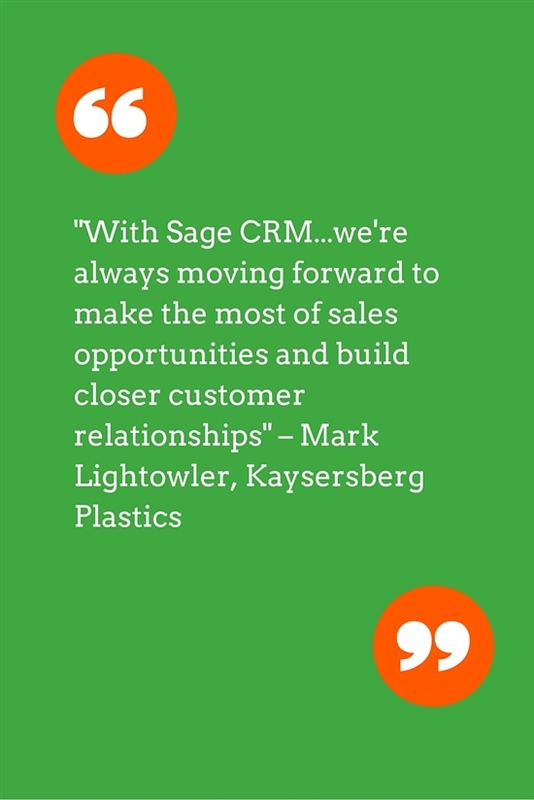 Sage CRM has increased Kaysersberg Plastics' sales efficiency, improve customer communications and given the company's team a better understanding of what customers want. “With Sage CRM, the next step is automatically built into the process, so we're always moving forward to make the most of sales opportunities and build closer customer relationships," says Mark Lightowler, Managing Director of Kaysersberg Plastics. Prior to using Sage CRM, the manual sales processes at Wong Fong Engineering Works were out of date and inefficient. They hampered the productivity of employees and prevented the company from understanding what customers want. Today, Sage CRM enables the company to automate business processes around leads and the issuing of quotes. The company also uses Sage CRM to take orders and track sales. And the engineering company's employees can access this information from anywhere. As a result of this fully automated sales process, Wong Fong has achieved productivity gains and streamlined its operations. “Right now, with Sage CRM, we are able to create quotes within minutes and managers can provide the approval online, via a mobile device if necessary,” says Sunny Liew, Sales and Marketing Engineer at Wong Fong Engineering Works. Prior to purchasing Sage CRM, Australian IT company Rockend was managing five different internal IT systems that did not communicate with each other. These disparate legacy systems were hindering the efficiency and future growth of the company. Rockend needed an integrated system that would increase process efficiency and give employees a complete view of the customer. The company implemented an integrated Sage 300 ERP and Sage CRM solution to provide key infrastructure for future growth. Today, Sage CRM integrates with the company's website and automates the online ordering process. Rockend also uses email marketing within Sage CRM to create targeted and intelligent campaigns based on the preferences and interest of its audience. As a result, Rockend has eliminated the silos of information within the organisation, allowing it to make more informed decisions and respond to customers and the market faster. “Everyone in the company can now see all the information they need about customers, and Rockend is providing better customer service as a result,” says John Goddard, CEO of Rockend Software. Louisiana Economic Development (LED) required a more robust CRM solution to help manage disaster recovery efforts for businesses in Louisiana in the United States. Sage CRM has enabled Louisiana Economic Development to successfully assist thousands of businesses, including providing temporary housing to more than 1,000 displaced workers. It has also improved marketing and project tracking, all coupled with increased financial accountability. “Based on our past experiences, LED assumed all CRM packages would be cumbersome and inflexible. That myth was quickly dispelled when we had to take a crash course in Sage CRM,” says Linda Regina, Director of Policy and Planning, Louisiana Economic Development. Lincoln Waste Solutions needed a CRM solution for managing its sales pipeline, improving customer support services, and for gaining a better view of its business. Sage CRM provides a single source of data that integrates sales, customer service and marketing. This solution also provides business insight for the company's management team. Thanks to Sage CRM, Lincoln Waste Solutions has become a more agile business and has improved customer support by 40 percent. “Sage CRM drives efficiency which is the same as profitability for a business like ours. Information is king. It gives us a level of reporting and a snapshot of each aspect of the business with a level of detail we didn't have before," says Jay Lentz, Client Development Executive with Lincoln Waste Solutions. Sirromet Wine is an Australian winery. The company sells its products primarily through a mobile workforce, and until recently each salesperson was responsible for managing customer information. This made it difficult for the company executives to gauge market trends and customer responses to various marketing campaigns. It also hampered strategic planning. 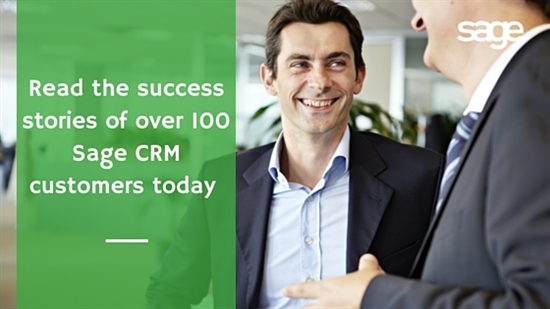 Thanks to Sage CRM, the company saves its customer information in one place. With Sage CRM, Sirromet can also make decisions based on marketing intelligence such as stock movement and product availability. “This data greatly assists head office in measuring the ROI of its promotional activity, as well as in monitoring market and industry developments.It also allows immediate communication from the management and marketing team direct to the sales staff for any urgent action or information dissemination," says Ian Parker, IT Manager with Sirromet Wines. Konica Minolta Bloemfontein is a South African distribution company. Prior to purchasing Sage CRM, it used separate software systems for managing business information. This way of working proved unproductive and costly. Konica Minolta Bloemfontein implemented Sage CRM and and gave its sales teams access to live data and communication channels. The sales teams can now access current customer information and deliver on their commitment to generate superior relationship marketing. “It became increasingly important to make the customer a partner in our daily business processes and to achieve this we needed a 360-degree view of our customers," says IT and Engineering Solutions Manager Ronald Rens. Katalina Media is a UK-based media production company. It uses Sage CRM to target corporate businesses and organise its sales efforts. According to managing director Toby Pannell, Sage CRM has allowed Katalina Media to look at prospects in detail and identify the best performing campaigns, and allocate its time more efficiently. The company can also track a more clearly defined sales process within Sage CRM. This has helped to increase the number of sales and customer sign ups. “The ease of use and flexibility of the system has allowed us to rapidly implement and evolve our sales model helping to contribute to a 240 percent YOY revenue growth," says Toby Pannell, Managing Director of Katalina Media. Cortland Banks found it difficult to track and administer multiple financial products. It also wanted a way of identifying new opportunities and monitoring loan covenant requirements for its growing number of account relationships. The company chose Sage CRM to retain a complete record of a customer's products and communications in one place. Sage CRM also helps the finance company to streamline its call and sales prospecting pipelines, view client interactions, and create in-depth reports. As a result, Cortland Banks has better and more accurate records of customer interactions. “Reporting is now phenomenal. 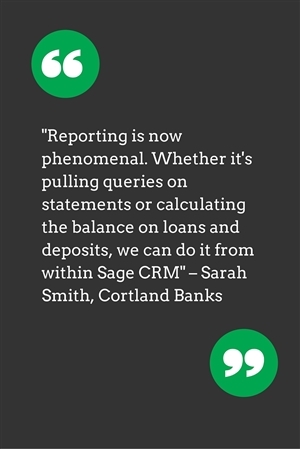 Whether it's pulling queries on statements or calculating the balance on loans and deposits, we can do it from within Sage CRM,” says Sara Smith, CRM Administrator, of Cortland Banks. On this revamped success story section of our website , you can read more about the experiences of our customers. You can also download PDFs of these success stories or watch videos that show how our customers use Sage CRM. Finally, don't forget to watch our SlideShare and discover eight powerful ways manufacturing companies are using Sage CRM to grow their business today.